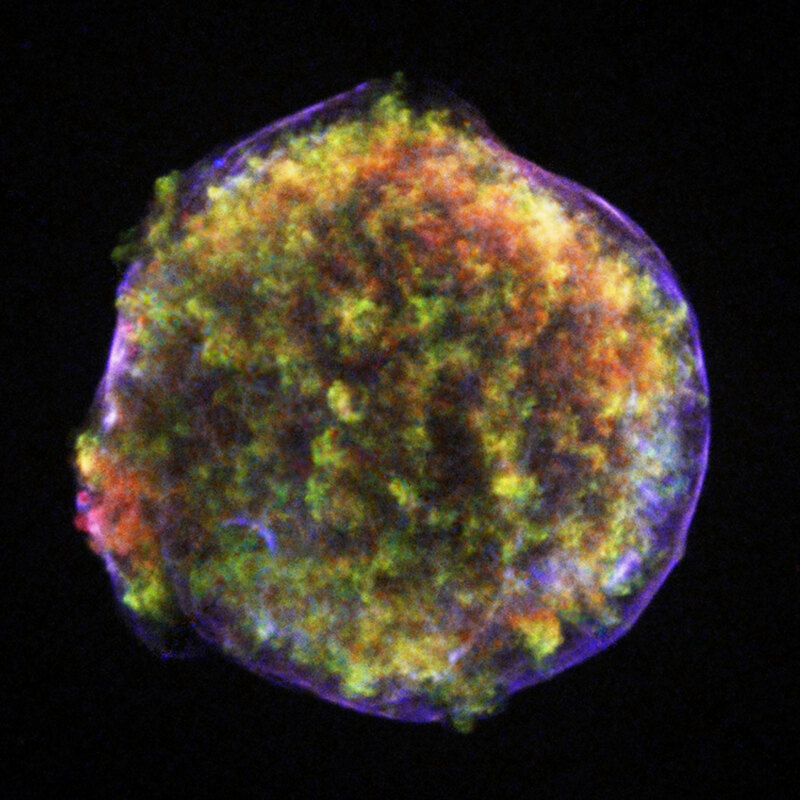 Tycho’s Supernova remnant. The bubble-like structure is caused by a shock wave, a type of sound wave. Credit: NASA/CXC/Rutgers/J.Warren & J.Hughes et al. Previous post in this series: Volcanoes. Q: A friend of mine is convinced that there is sound in space. There isn’t, right? Randall’s response: A guy floating in space speaks, but the speech bubble is empty. They say that “in space, no one can hear you scream” because there is no air in space to carry sound waves, but that’s not quite true. There is a little bit of gas in space, mostly hydrogen, that astronomers call the interstellar medium. It’s the same stuff that stars form out of. It’s a tiny amount of gas, on average only one atom per cubic centimeter, but it’s there. For comparison, ordinary air has 10 billion billion molecules per cubic centimeter. Even dense parts of the interstellar medium like the Orion Nebula are thinner than the best laboratory vacuums on Earth (partly because atoms evaporate from the material of the vacuum chamber itself). Sound is caused by air molecules bumping into each other in a wave, and atoms in the interstellar medium are rare enough that they can go a long way before bumping into each other. In a typical part of the interstellar medium, they could go 100 billion kilometers (larger than the size of our solar system) before hitting another atom. (Although in dense regions like nebulae, it could be a lot less.) Because the atoms can go so far without colliding, sound waves can only form if they are larger than this. It would be impossible to hear the sounds in space without ears on the scale of light-years. However, we know these sound waves exist because we can see them. When the atoms in the gas collide, they produce X-rays that we can detect with space telescopes. In 2003, NASA scientists discovered the deepest sound waves in the universe, shock waves produced by a super-massive black hole in the Perseus Cluster of galaxies that come hundreds of millions of years apart. As a bonus, you might ask what is the speed of sound in space. On Earth, it’s about 340 meters per second, or 730 miles per hour, depending on atmospheric conditions. The speed of sound in an ideal gas is SquareRoot( gamma * pressure / density ). Gamma is the adiabatic constant, which is 5/3 for hydrogen atoms. The typical density of the interstellar medium is 1 atom per cubic centimeter, its temperature is about 8,000 K, and by using the ideal gas law, you can eventually work out that the speed of sound in such conditions (and remember that conditions may vary widely in the interstellar medium) is about 10,500 meters per second. Sound actually travels faster in space than in air. This entry was posted in Space, What If? Rejects and tagged interstellar medium, no one can hear you scream, sound in space. Bookmark the permalink. This was a fascinating read. I had no idea how sound really worked, let alone why it doesn’t work in space. Thanks!